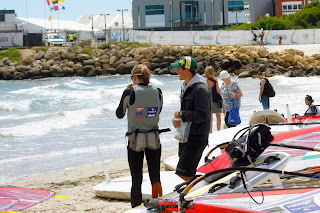 Two days ago the RS:X women's event concluded at the ISAF World Championships in Fremantle, and I'm really happy to announce that I qualified to be the US Olympic Representative in the RS:X women's windsurfing class. The regatta was also an opportunity to qualify the United States for a berth at the Olympics. 28 countries will compete at the Games, and here, the top 20 countries were selected. I missed qualifying the USA by a slim margin, but will have another opportunity at the Worlds in Cadiz next March. 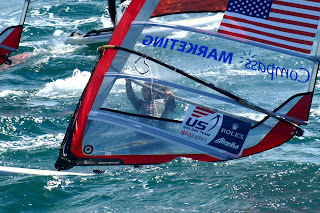 The ISAF Worlds are the peak event of the year and the level of the competition reflected that. After training in Fremantle for over a month, I found a different perspective on the racing - I was having a lot of fun. For the past few months I've been really working on the board handling and technique in planing conditions. Working on technique meant that coach Max and I broke down a race to work on individual elements. I didn't do a lot of actual racing during training and instead focused on tacks, jibes, speed, and more "fun stuff." In return, I gained a lot of confidence in my board handling abilities and got a mental break from the more grinding practice races. I felt fresh and happy going into the regatta and noticed a lot of improvements in my racing. Another major difference that I noticed in my outlook was that I felt noticeably less tired after this event than most of my previous regattas. I attribute this to a slightly different approach to training; that after a lot of long sessions, a few races a day weren't incredibly tiring, and I felt so enthusiastic about the skills I learned over the past month that I maintained a high level of "stoke" throughout the event. I could see that I made measurable progress and looked forward each day to accomplishing goals. I still have a lot of work to do going into the spring season, but I've laid the foundation for a really great season both physically and mentally, and I'm looking forward more than ever to future events and lots of training! 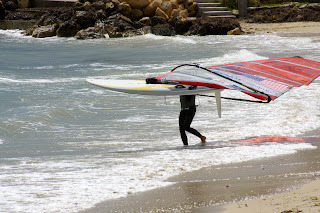 I have one more week left in Fremantle, and I'm taking the opportunity for more training in great wind and waves. I'd like to thank my sponsor Compass Marketing for all their support this year, and also the St. Francis Yacht Club Foundation, the Annapolis Yacht Club Foundation, the Southport Sailing Foundation (CleverPig), the Olympic Sailing Association at New Orleans, and all the folks who have been following and helping me with my campaign. You all make everything possible for me.